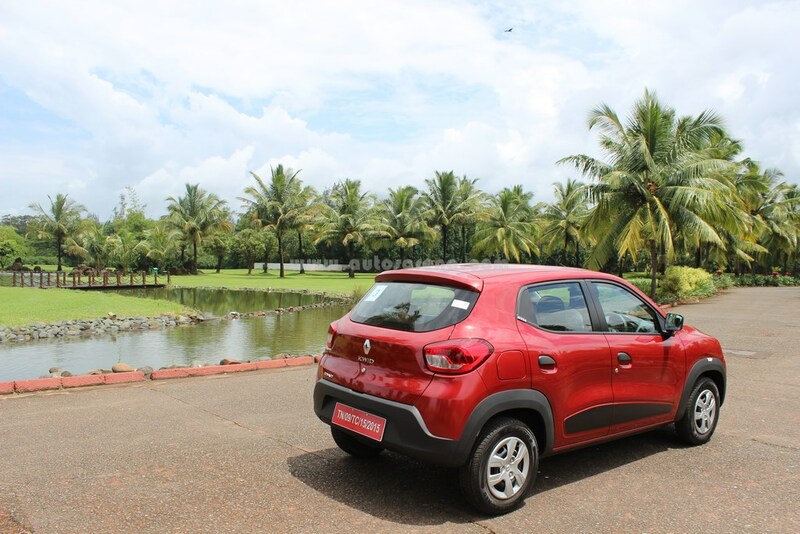 The Indian automobile market is dominated by small cars which accounts for more than 50% of the total sales. Of which a majority of the sales are of cars below Rs. 4 lakhs. 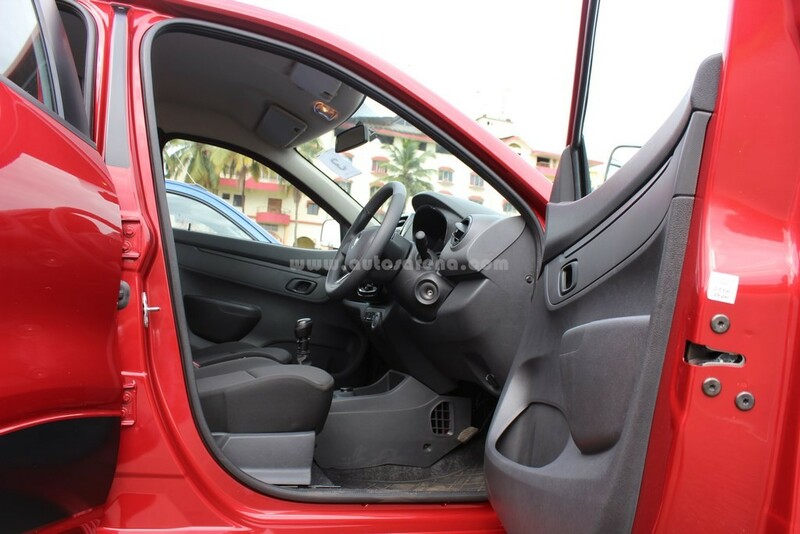 This is the segment where you find many first time buyers or people who have upgraded from an old second hand car. 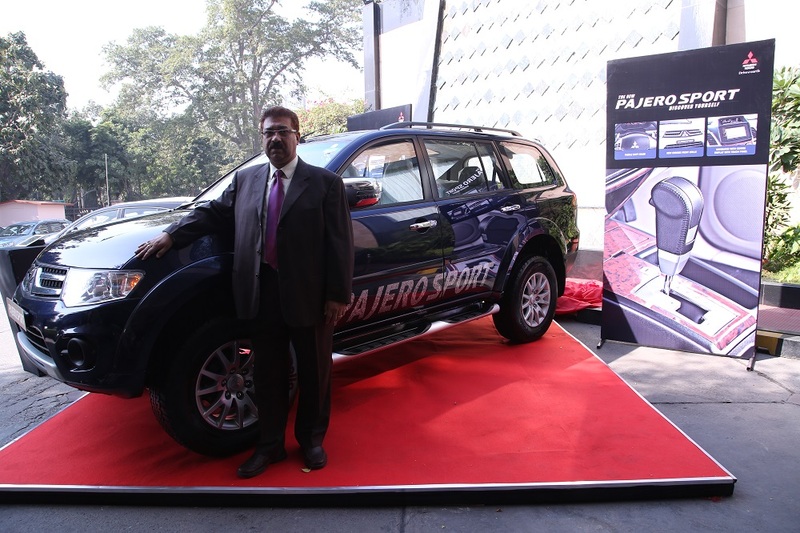 This segment has been predominantly dominated by India’s largest car maker Maruti Suzuki. Mr. Carlos Ghosn, CEO of Renault Nissan alliance was quite amazed with the Nano and soon announced their intention of a small car for the Indian market. The idea to concept to real car did take a good 5 years. 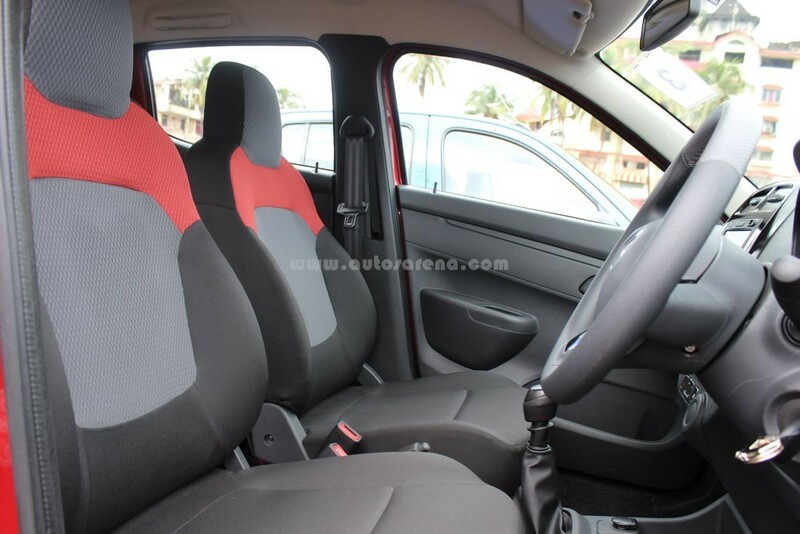 Nissan launched the Datsun GO which aimed at the risers, which include mainly the new generation first car buyers. 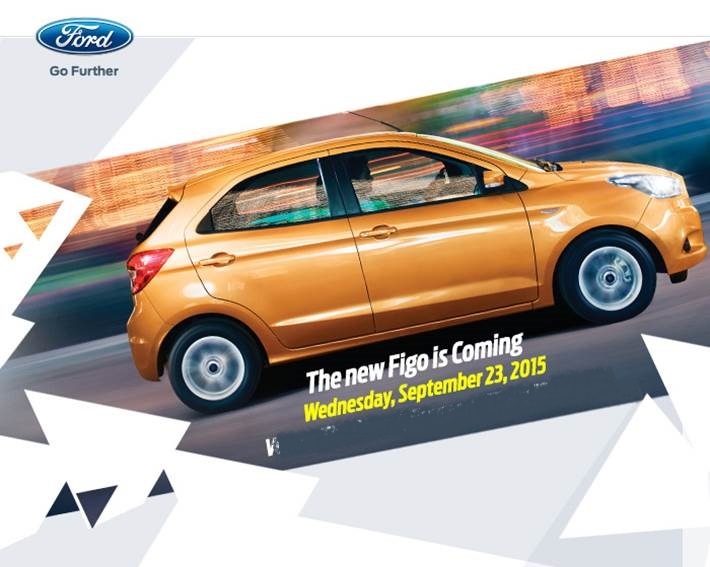 This move was not accepted by the Indian market and the GO did not meet the sales success. 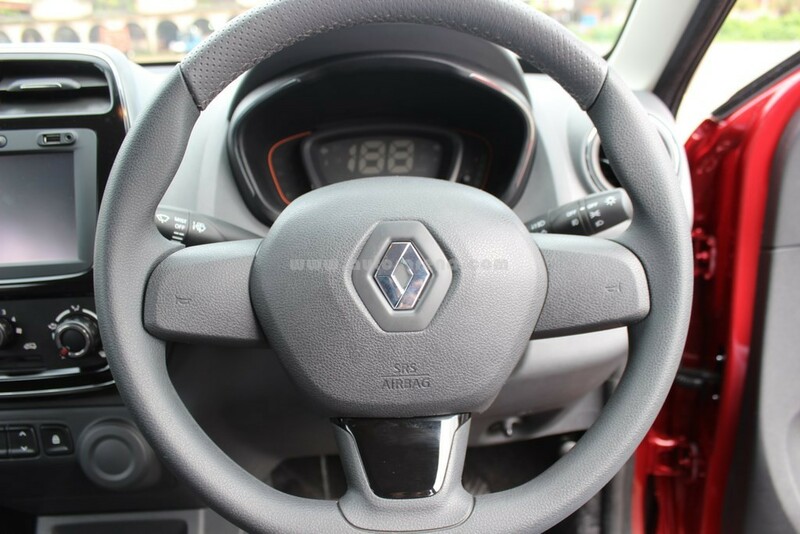 It was time for the French to get a car which could to meet sales success and help to establish a strong foundation. 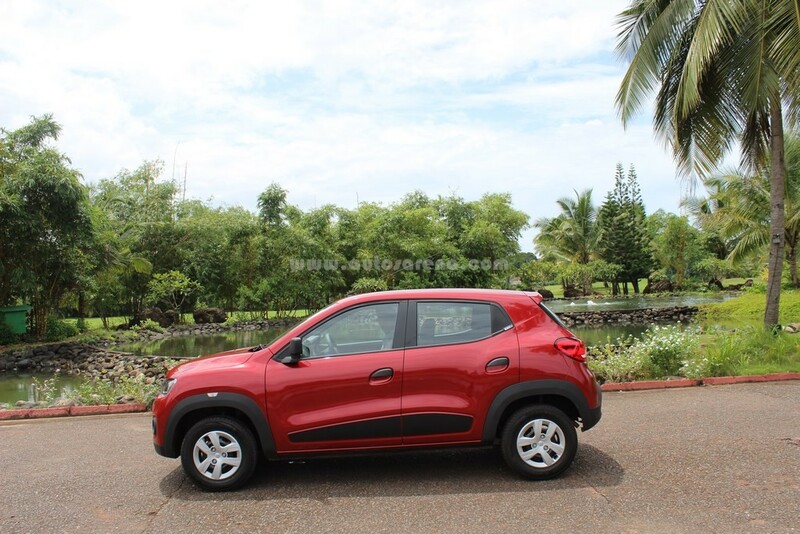 The Kwid small car was announced in May which is based on the new CMF-A platform and is a global car. 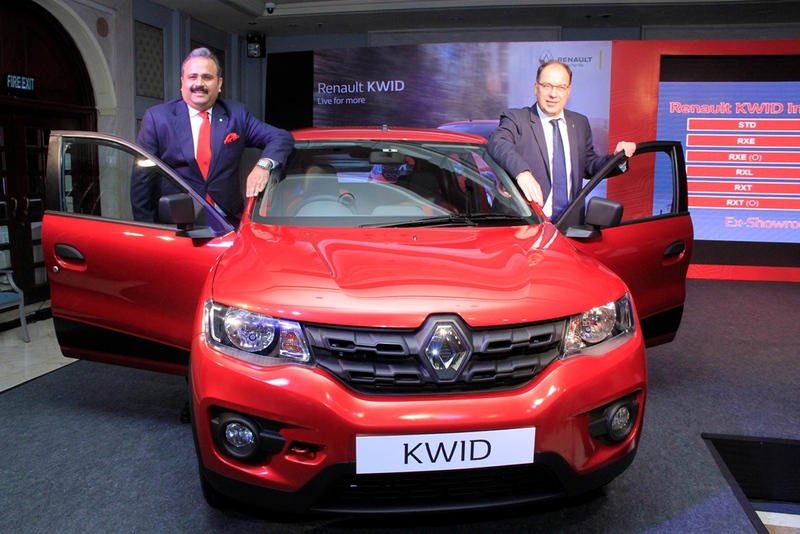 Renault has done their homework well and came up with the Kwid, a car which plans to shake the segment with Attractive looks, Innovative technology and an affordable price. 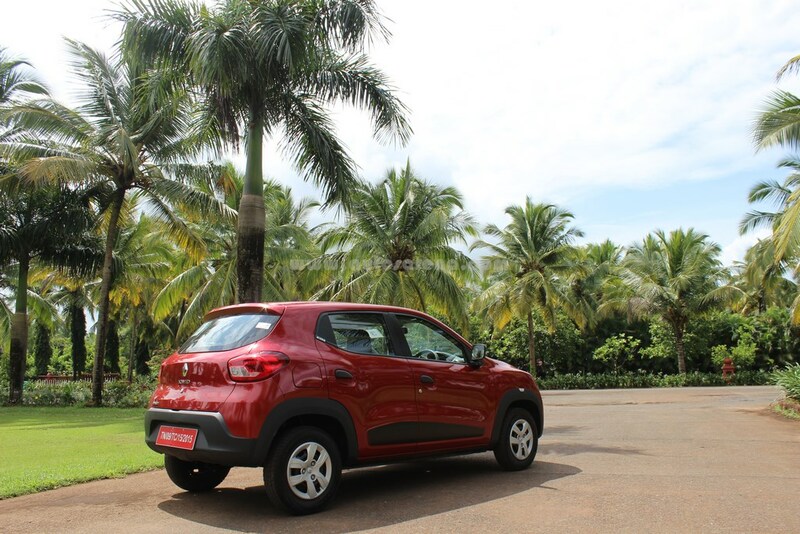 We test drive the car to understand how well the Kwid could dent the segment which has been dominated by Maruti Suzuki Alto. 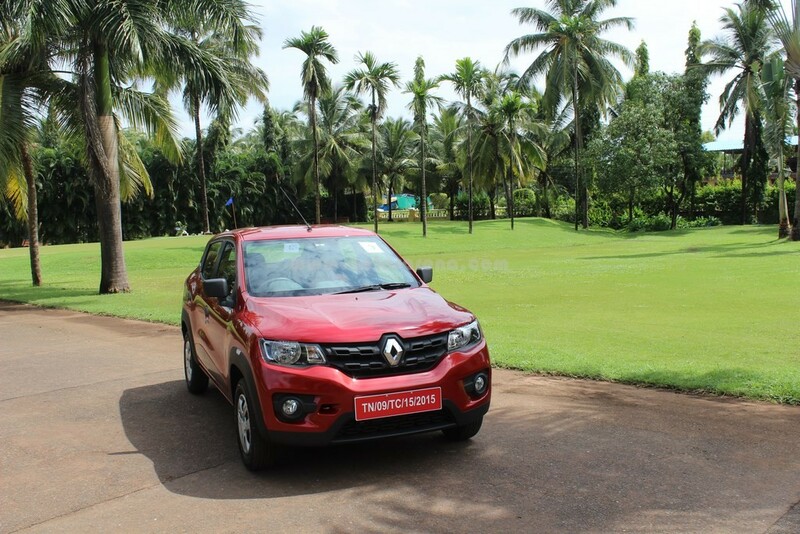 The designers at Renault have come up with a very interesting SUV inspired design which is very appealing at the first glance. 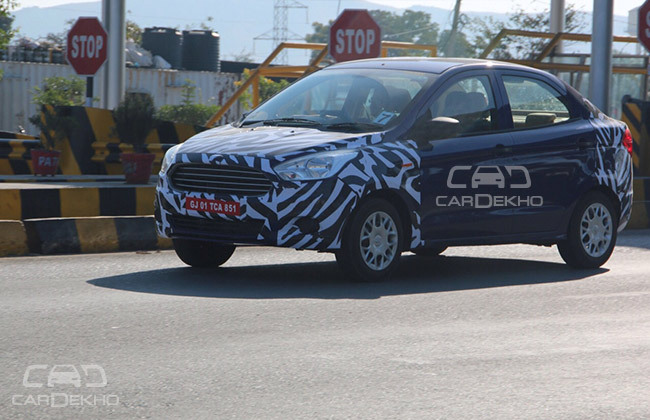 The car does look like a baby SUV and can be imagined as a mini Duster. 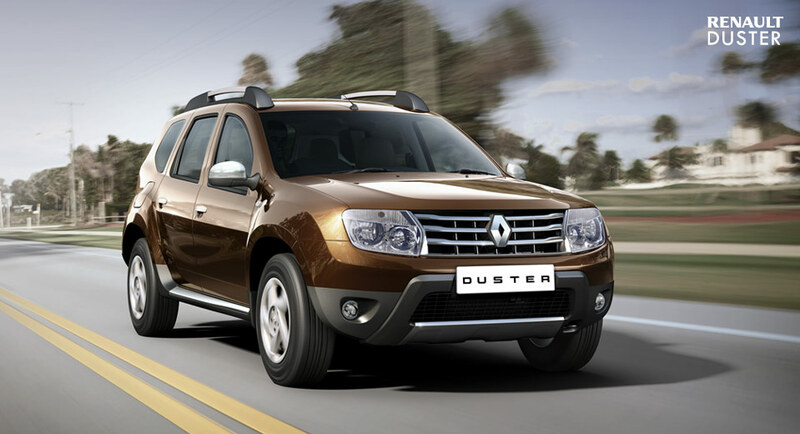 The front is dominated by the macho styling with a large bumper designed like a bow and bonnet with raised crease lines. 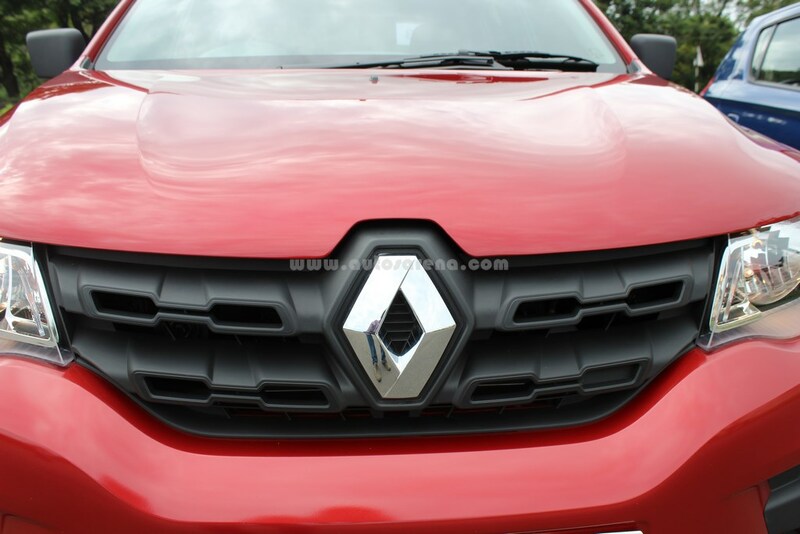 The large rhombus Renault badge and the structured black grille further ads to the styling. 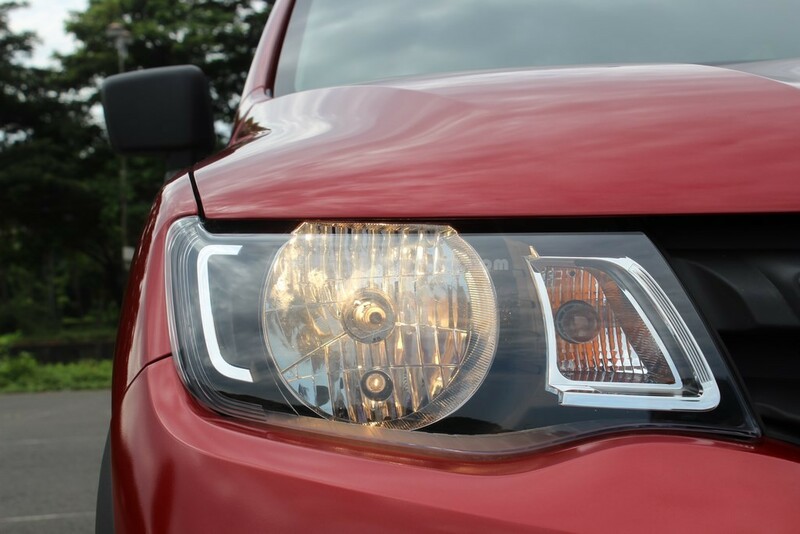 The headlamps are neatly designed with chrome detailing which resemble DRLs and separate housing for the side indicators. Overall the front has a very imposing stance and is one the best looking car currently in this segment. 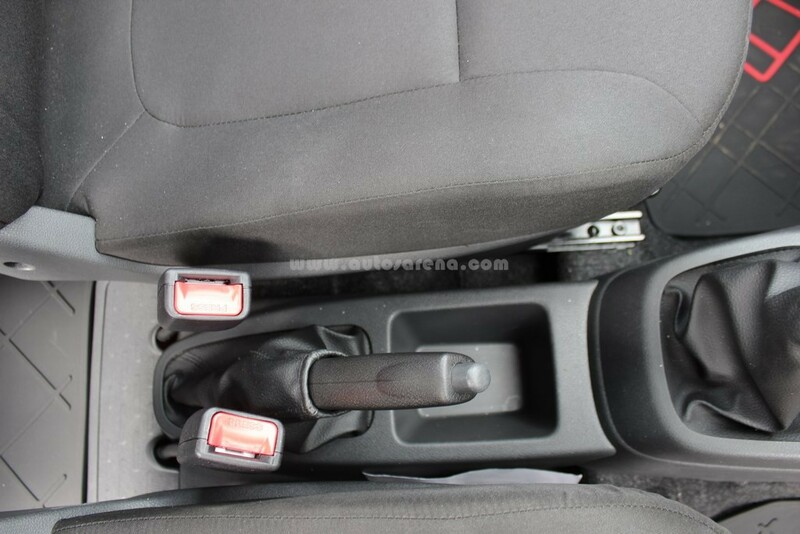 Dimensions are large for car of this segment. 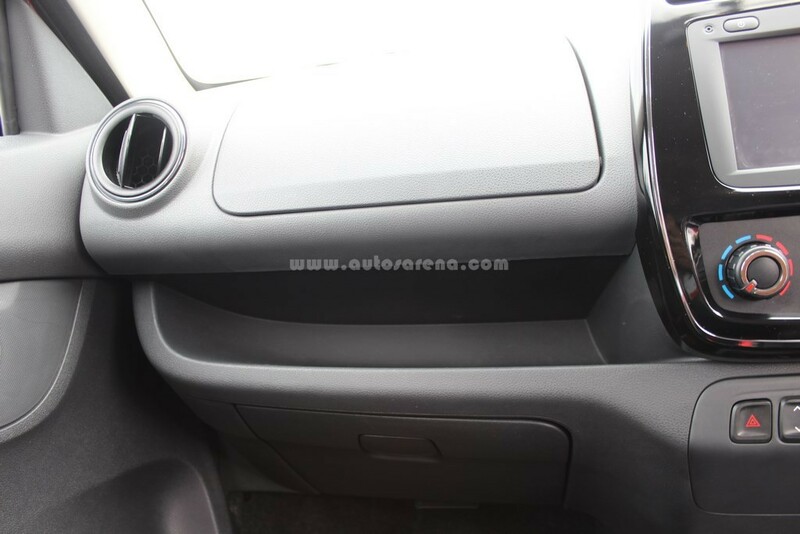 From the side the large black finish wheel arches and the side door moulding dominate the design further emphasizing the SUV inspired design. 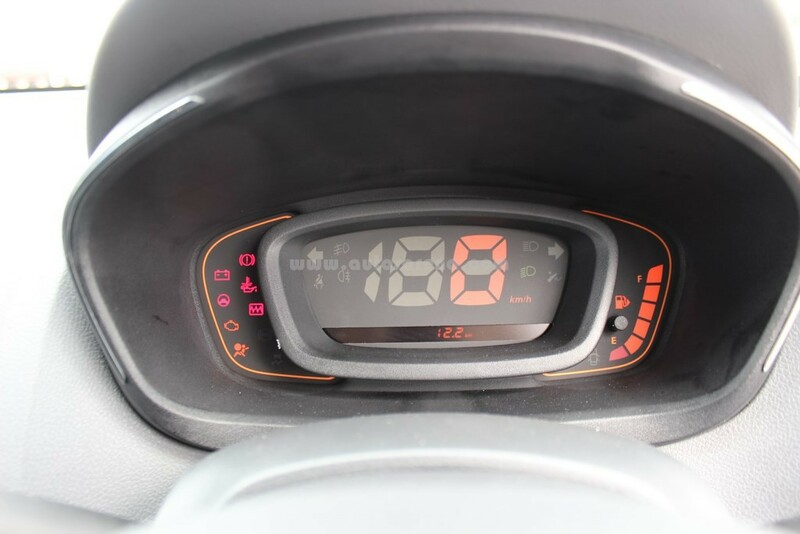 The side indicators are neatly integrated in the wheel arches but may not be visible due to its small size. 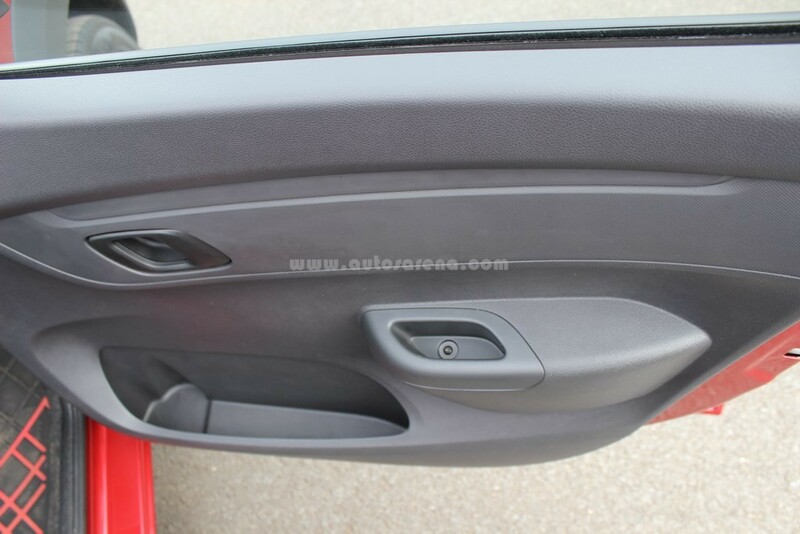 The door handles are oddly shaped in the contours and the ORVMs are small, which means smaller view of the on-coming traffic. The 13’’ tyres look small and there is no option of 14’’ or alloy wheels as standard even on the top end. 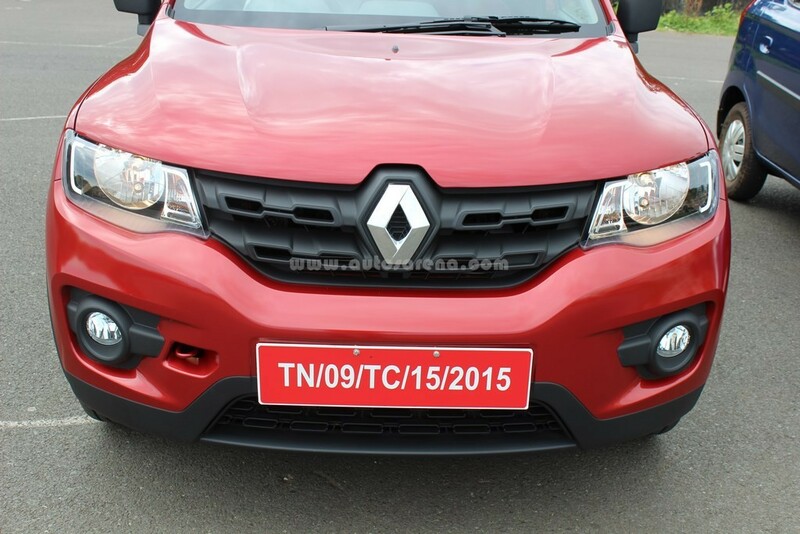 The rear design is toned down as compared to the front with concave like rear panel, two horizontal lines and Kwid lettering at the centre which is unique to other cars. 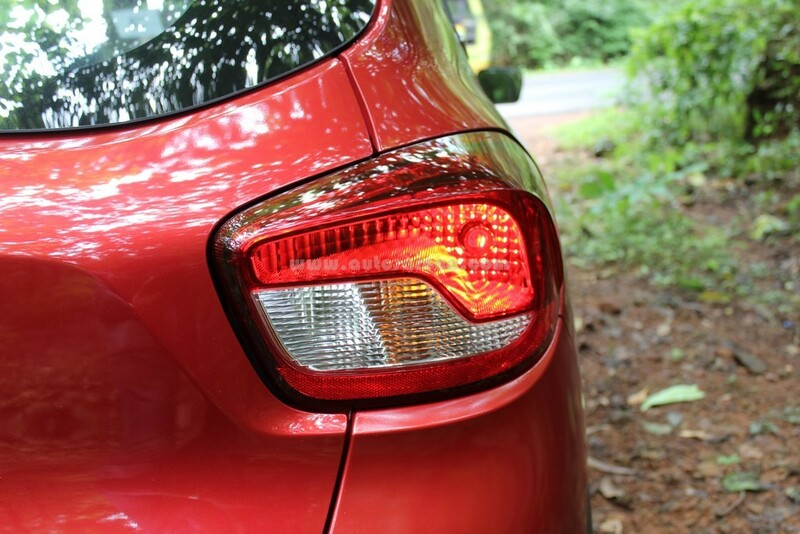 The tail light design is round and plain but the interior detailing is good. Visibility from front is good but the large C pillar obstructs the view especially when reversing. 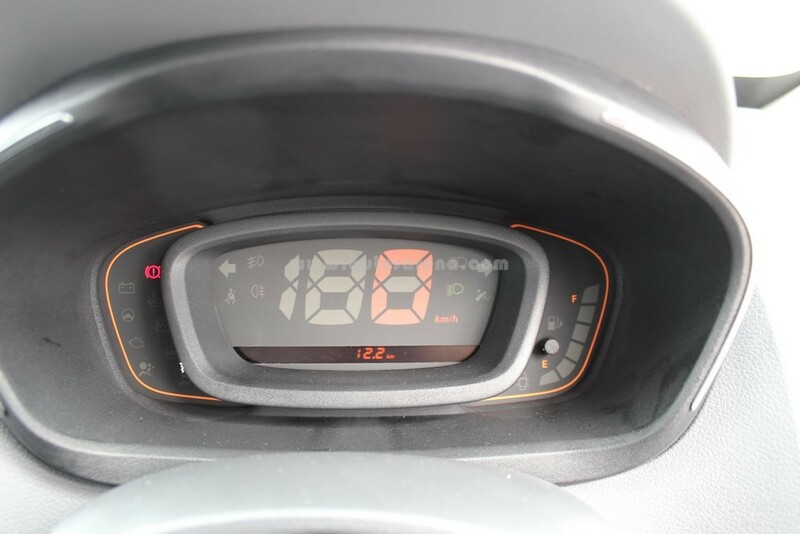 Note – fuel opening is given on the right hand side of the car. 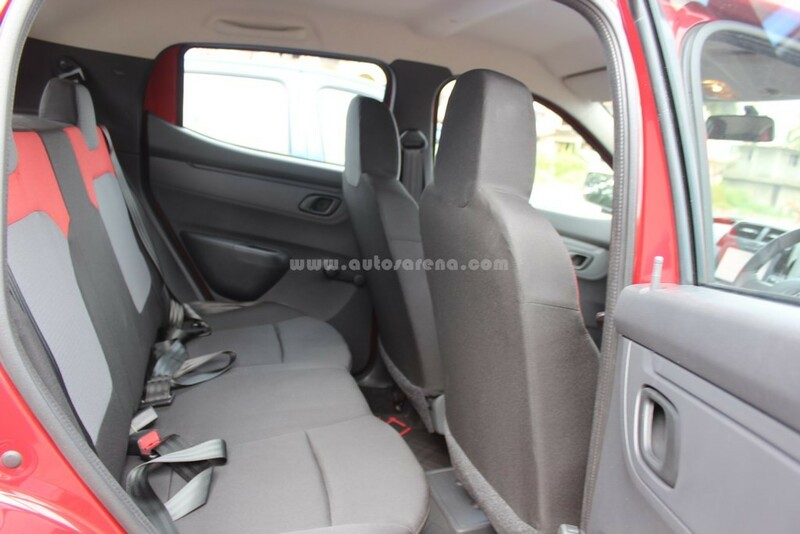 The interior has generous amounts of interior space and storage. 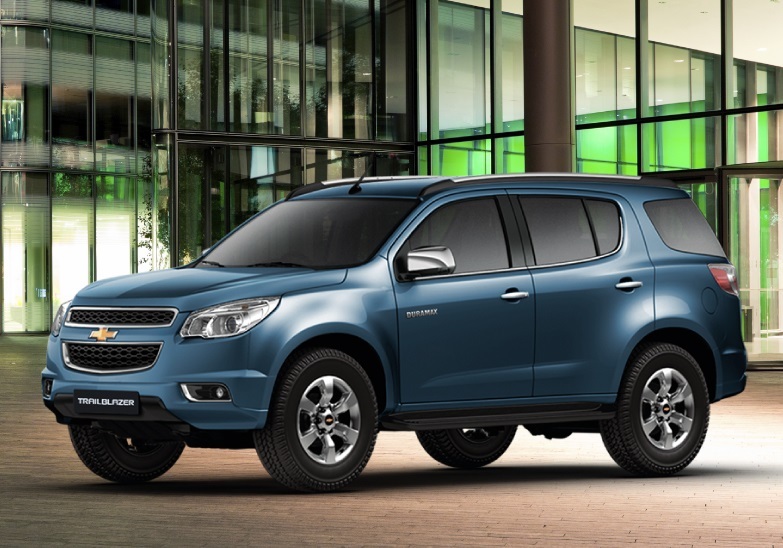 The long wheelbase of 2423mm offers ample of space for all the occupants and seats five easily. 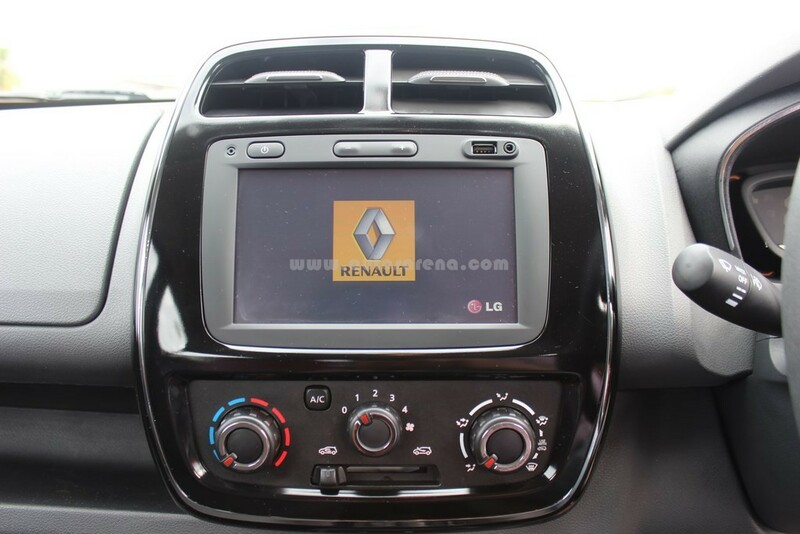 The dashboard design is very simple with a large 7 inch touchscreen Media Nav system The Piano Black finish on the centre console and steering give the car a more upmarket feel. 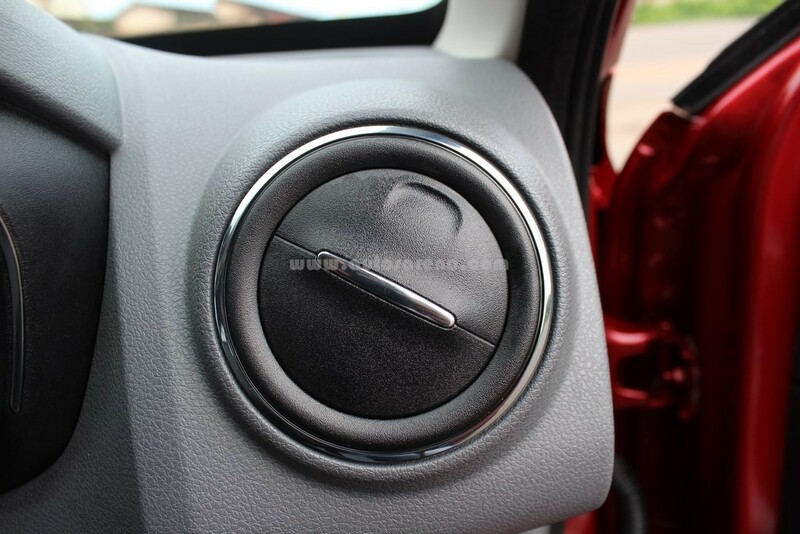 Rotary knobs are easy and simple design and the three spoke steering provides a confidant grip. 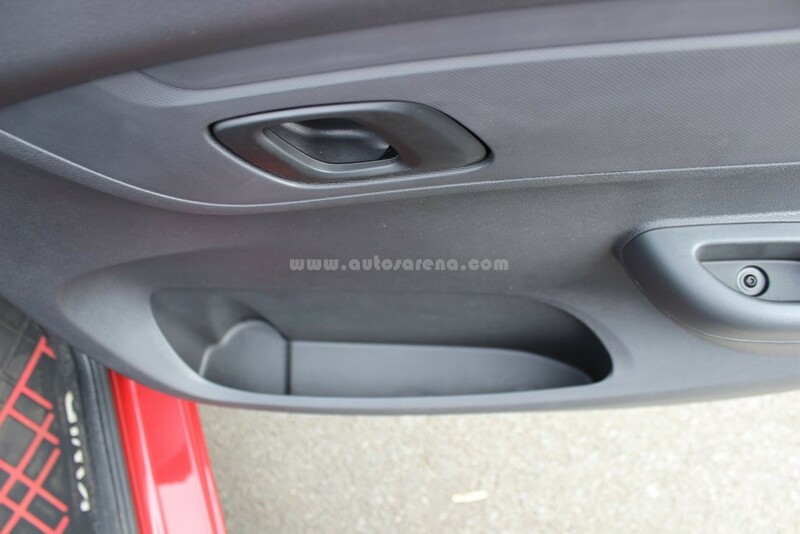 Renault has done some cost cutting on the quality of plastics such as air vents and door panels. 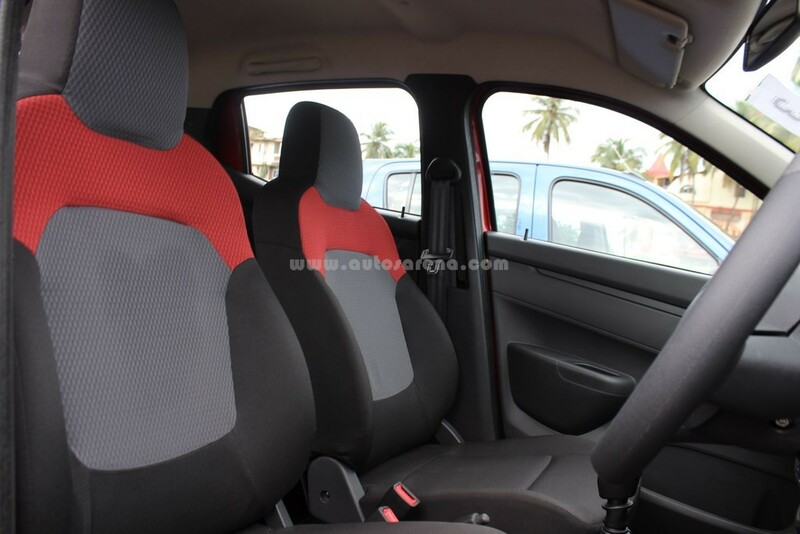 The seats offer good cushioning and support and can be classified one of the best in segments. 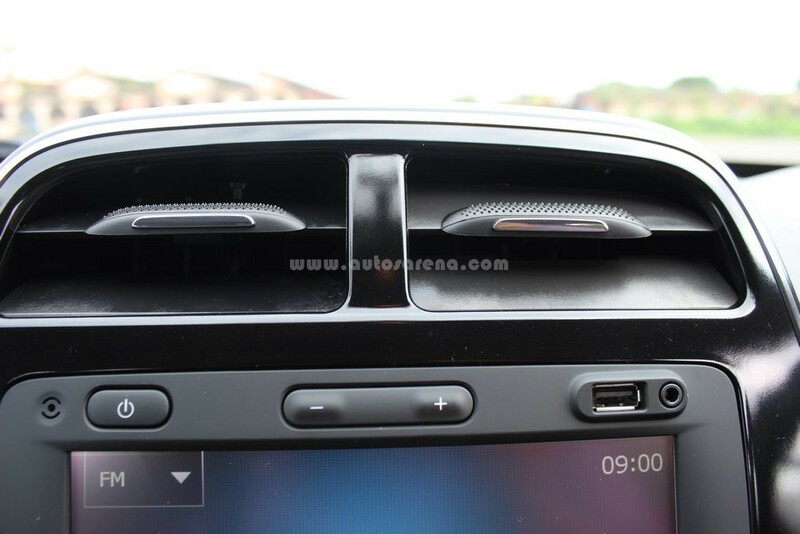 Head rests are integrated and seat can be adjusted for leg space and back support. 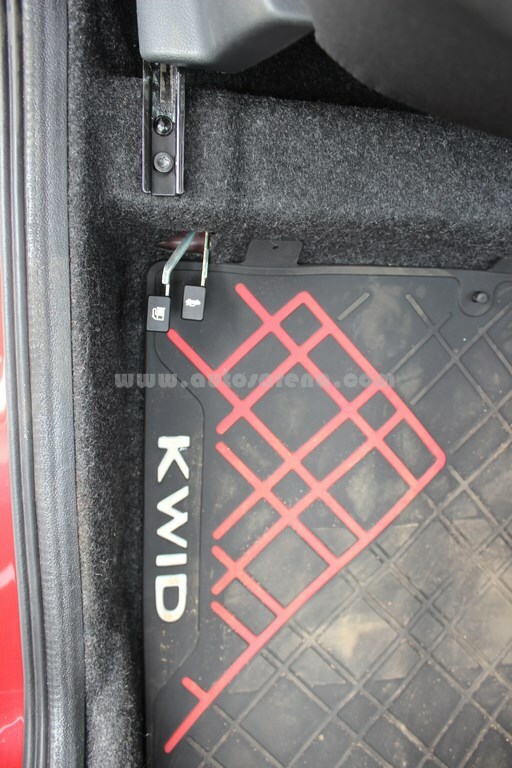 The Kwid has the best-in-class boot space of 300 litres which is more than the Maruti Suzuki Swift and comparable to a compact sedan. 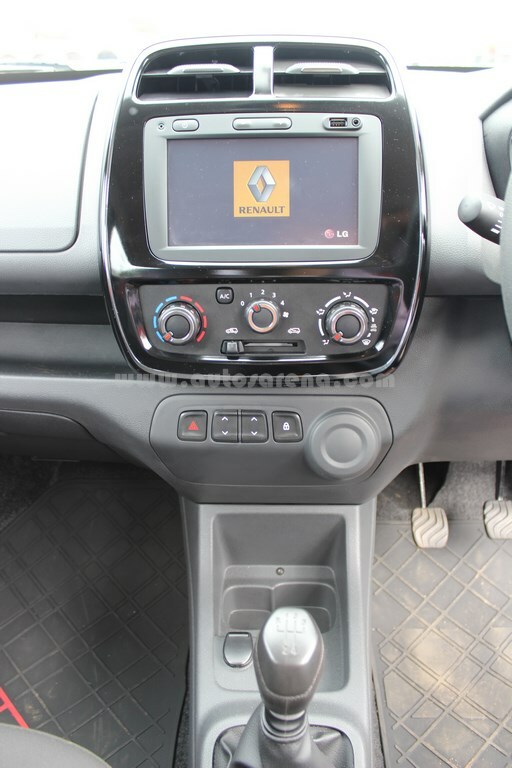 The boot space can be extendable to 1115 litres by folding the seat which offers superb flexibility & convenience. 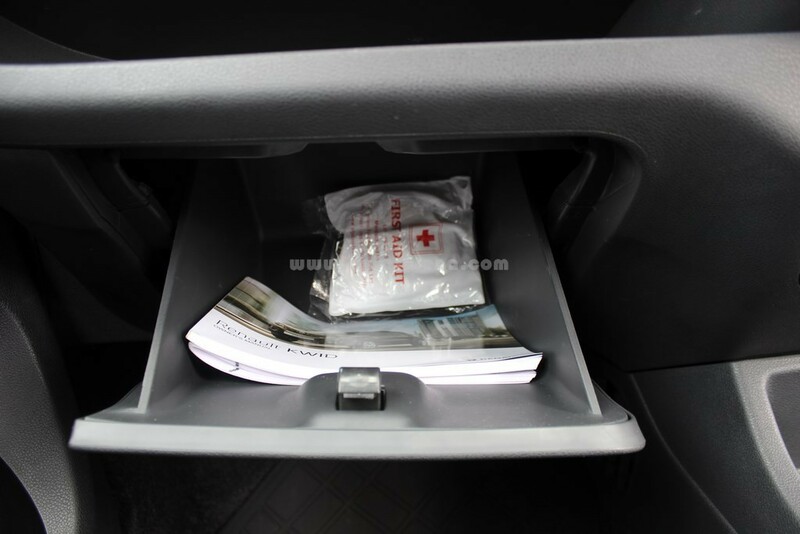 There are 2 glove boxes and more space on the doors and centre console to keep all the handy stuff. 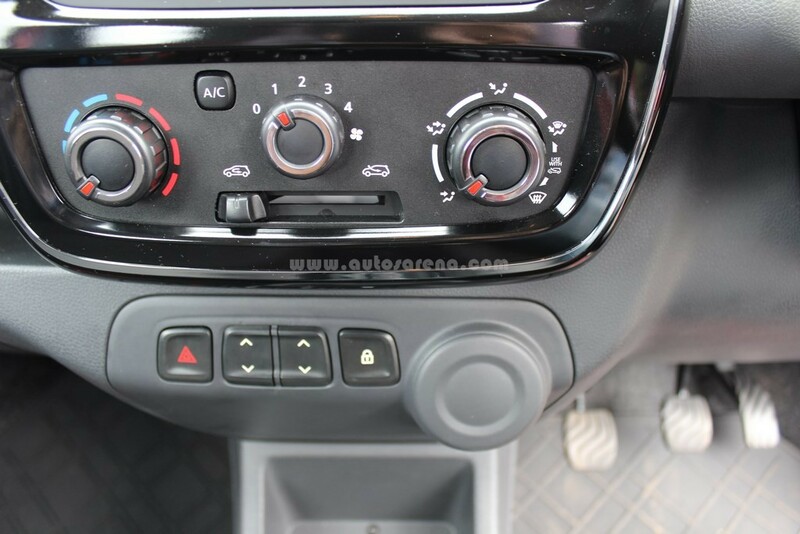 Overall ergonomics are good except for the power window switches located on the centre console which requires you to stretch in case you want to open or close the window. 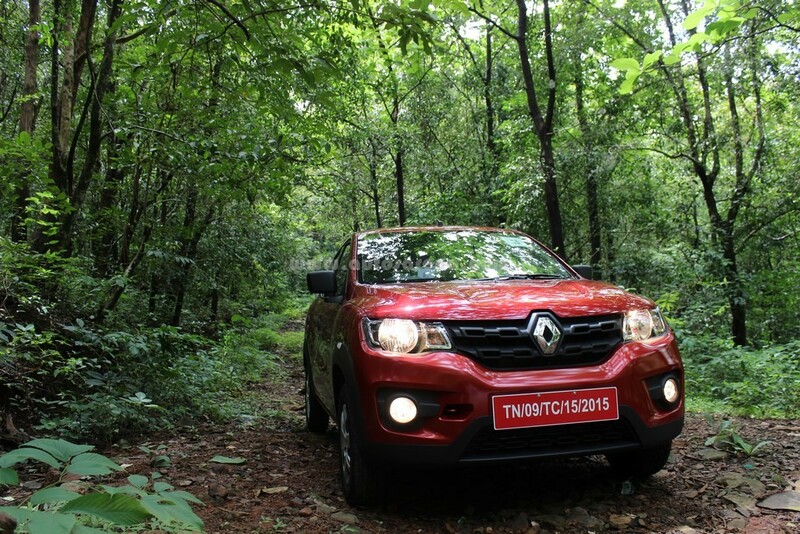 The Renault Kwid does surprise you in terms of performance. 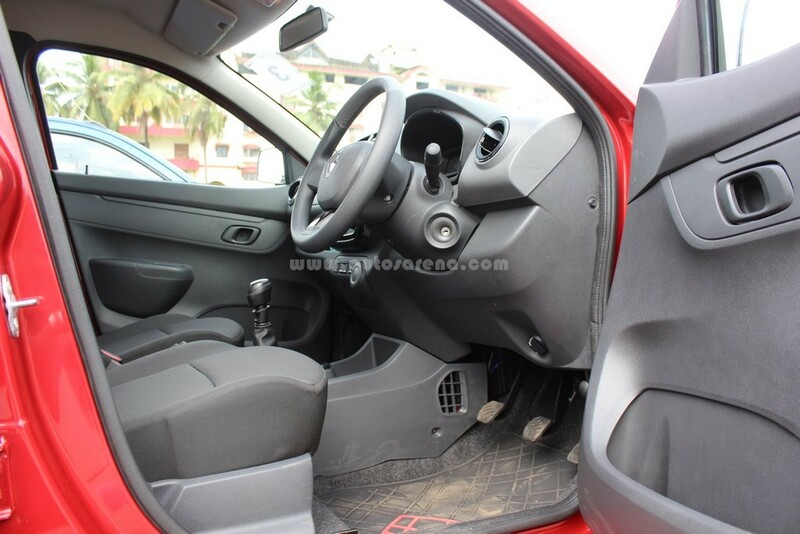 The engine is a new 3-cyl, 800cc with 4-valve-per-cylinder DOHC arrangement. The engine produces 54 Ps @ 5678 rpm max power and 72 Nm @ 4386 rpm max torque. 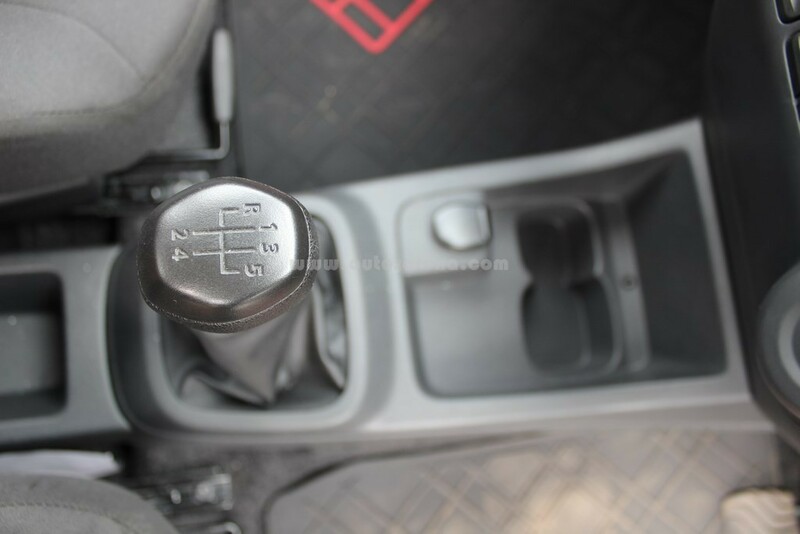 The engine is mated to a 5 speed gear box and you need to press the switch on the gear know to shift into reverse, which gets many new drivers confused. 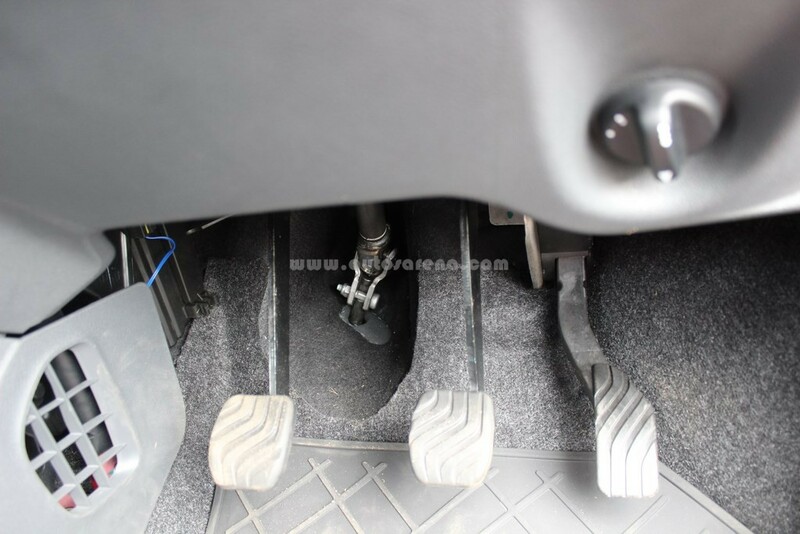 Driving in initial gears is quite boring with the engine getting strained when pushed hard. 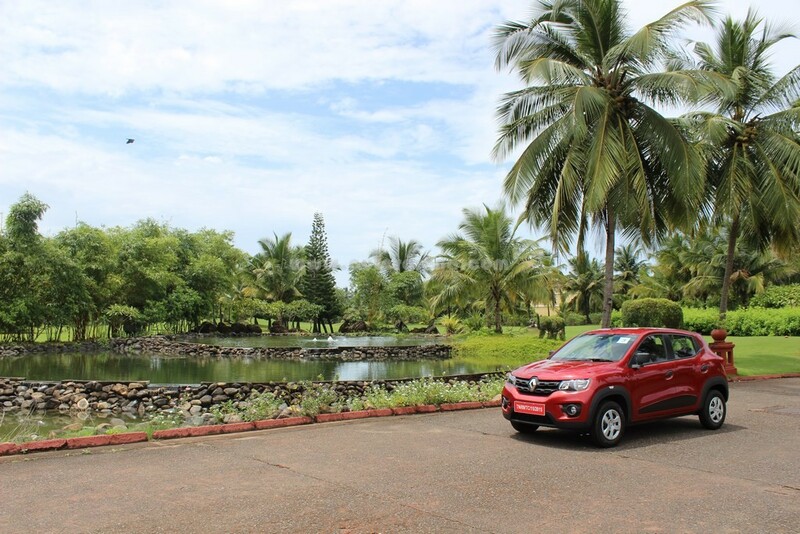 Once you cross the mid-range car behaves decent and comfortably cruises upto speeds of 120 kms/hr. For those who want know, kitna deti hai? 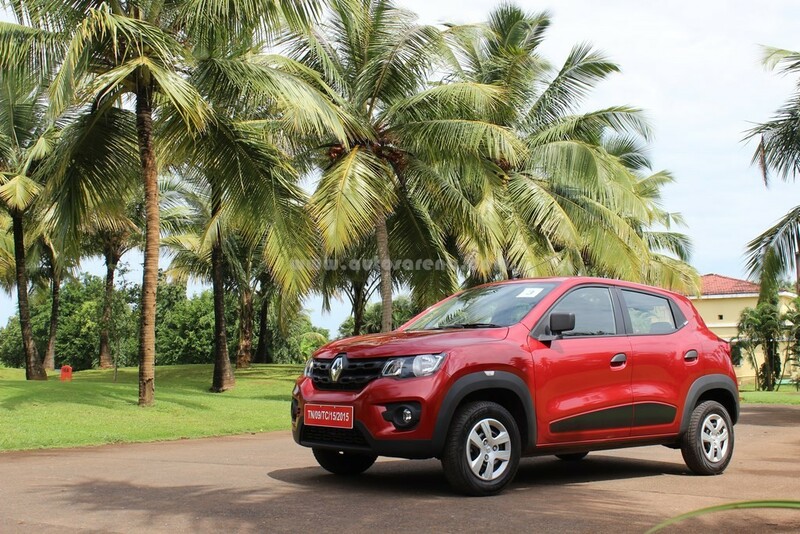 The Kwid delivers 25.17 Kmpl* which is the highest when compared to any petrol car available in India. 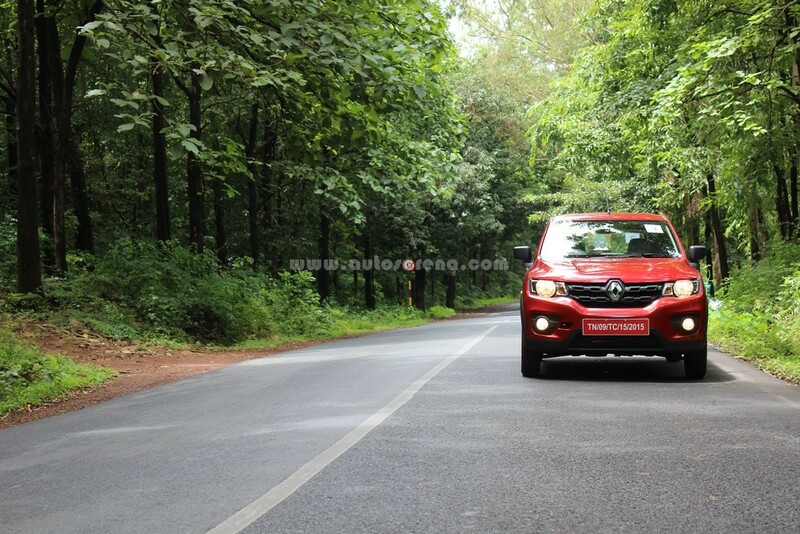 The suspension setup with Mac Pherson Strut with lower traversing link at front and Twist beam suspension with coil spring at rear is designed keeping the bad Indian roads does it job well. 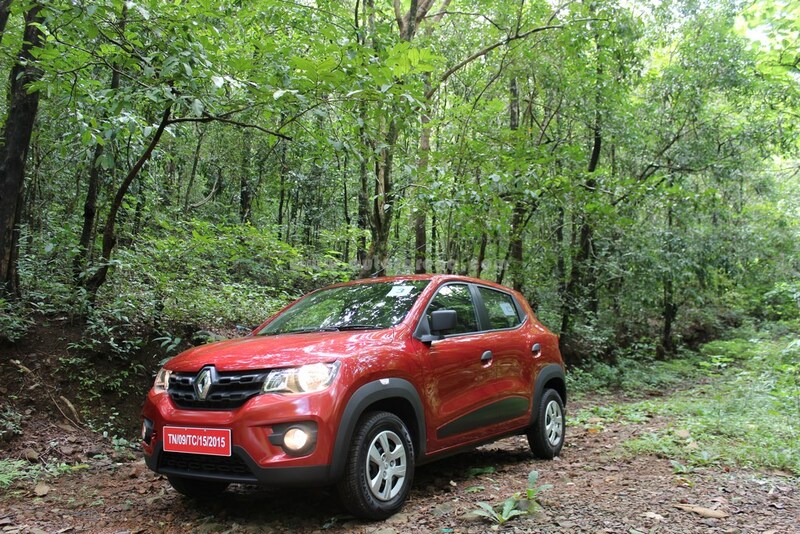 The Kwid offers a planted and stable ride and provides the required confidence on highways and twisty roads. 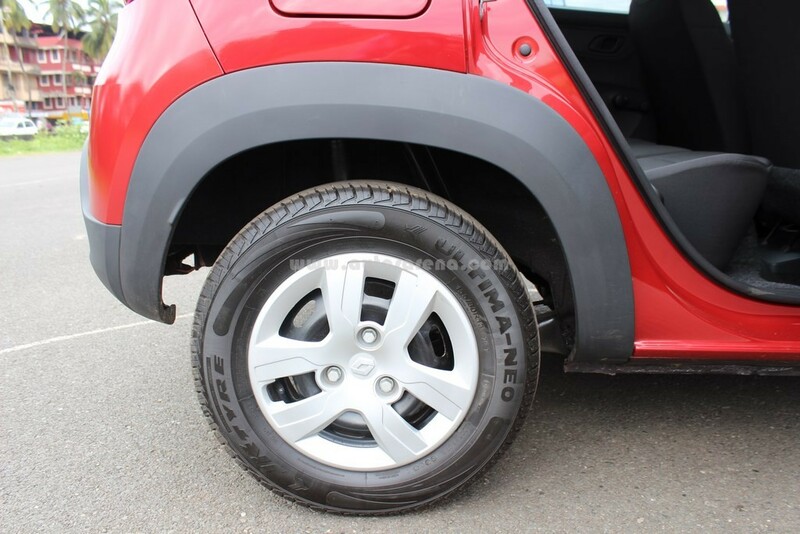 The high ground clearance of 180mm helps to drive on bad terrains with ease. 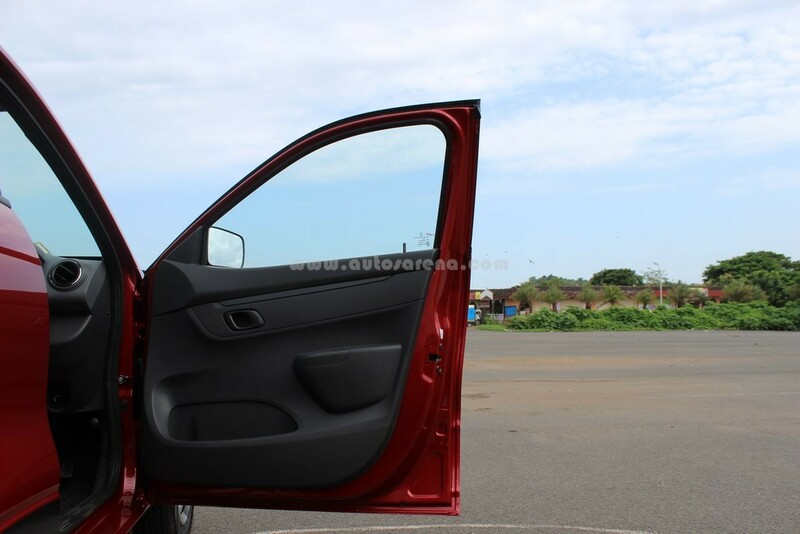 Handling is good and overall ride quality is quite superior for a car of this segment. Braking performance is similar to competition and one has to plan the stops in advance. Hopefully an optional ABS & EBD in future could be offered. 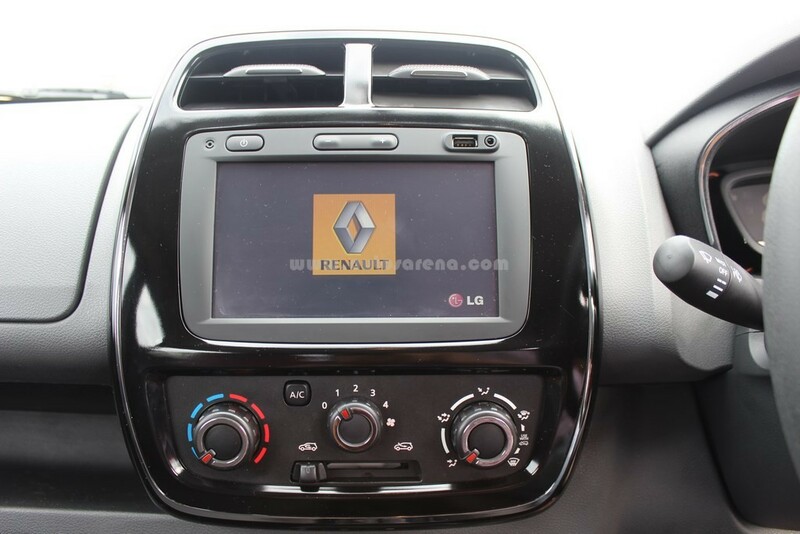 The Kwid comes with a segment first 7 inch touchscreen Media Nav system with Satellite Navigation offering 2D/3D view with one year free map update, Bluetooth Connectivity, phone & audio streaming, iPhone and iPod™ operations – Charging through USB, Audio content display and navigation of iPod™ through MediaNAV. 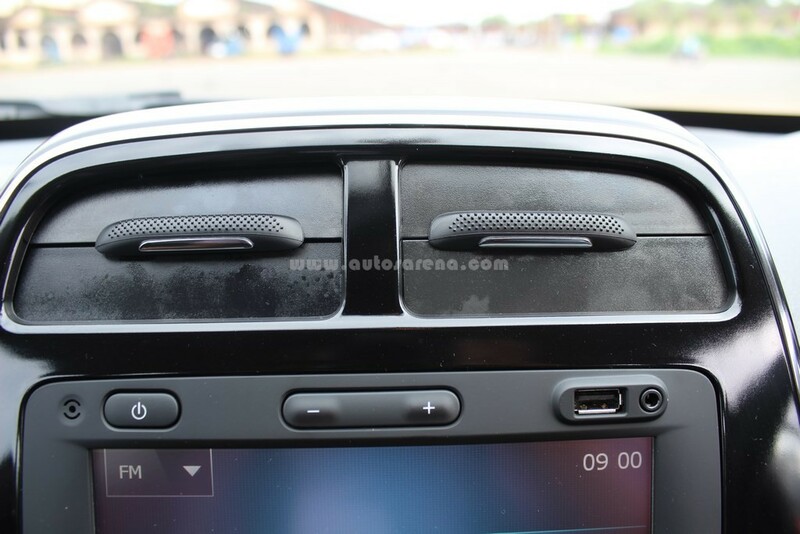 The car also gets USB, AUX-IN, SDVC for more media options. 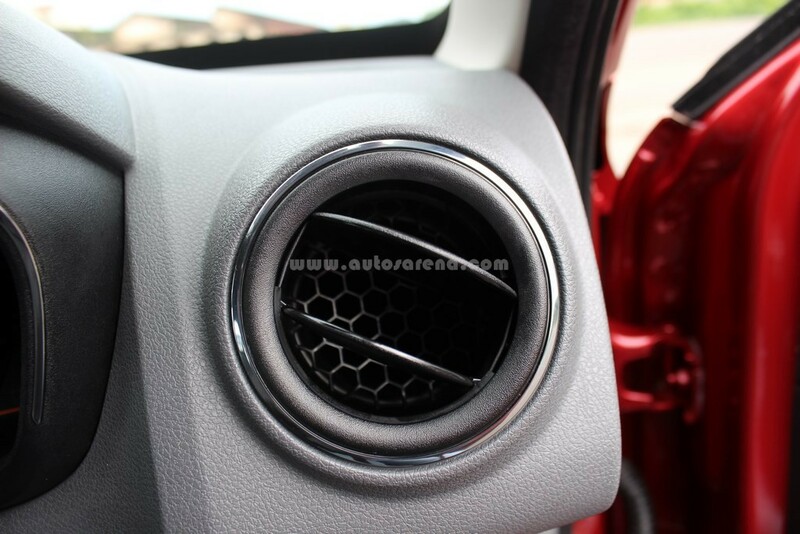 The sound quality of the audio system is decent and it takes some time to understand all the functions of the MediaNAV. 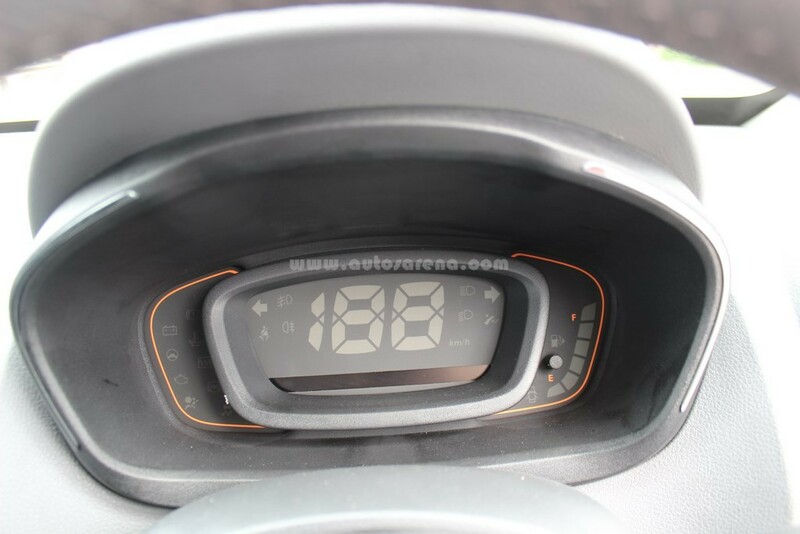 Another interesting feature is the digital instrument cluster which features an onboard digital trip computer that highlights gear shift indicator, distance to empty average fuel consumption, etc. 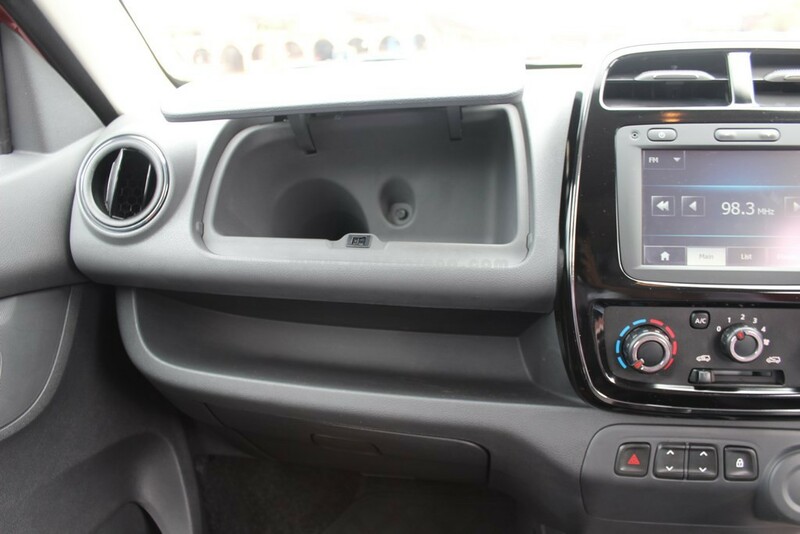 The Kwid also boasts of one touch lane change indicator, intermittent windscreen wiper with tear drop wipe. 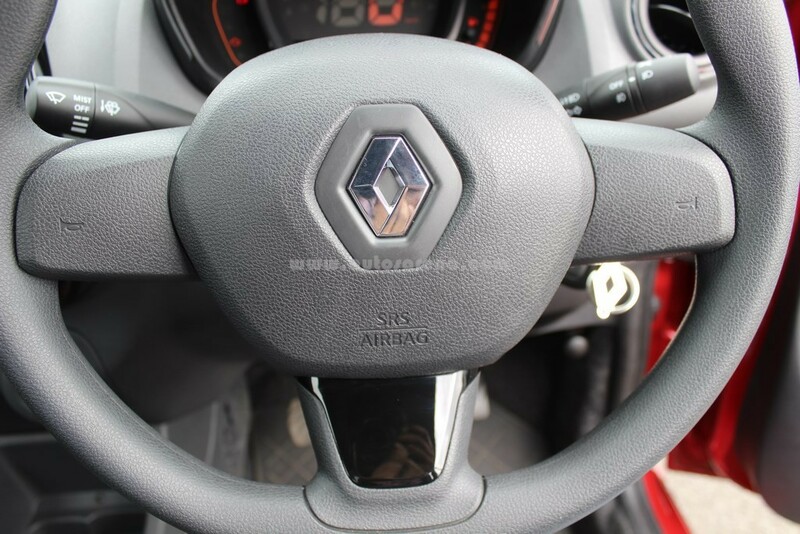 The external adjustment of mirrors is quite disliked considering Renault has offered so many thoughtful features in the car. 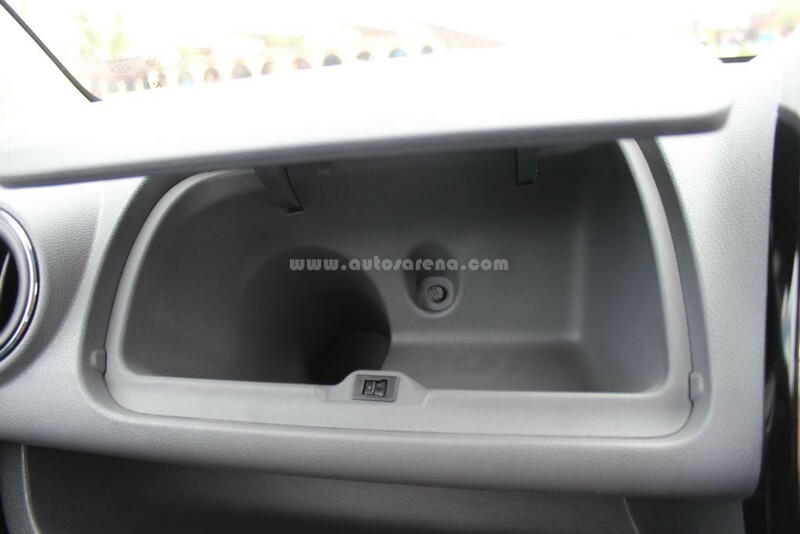 In terms of safety there is an optional air bag which is becoming a part of the standard equipment in higher segments. 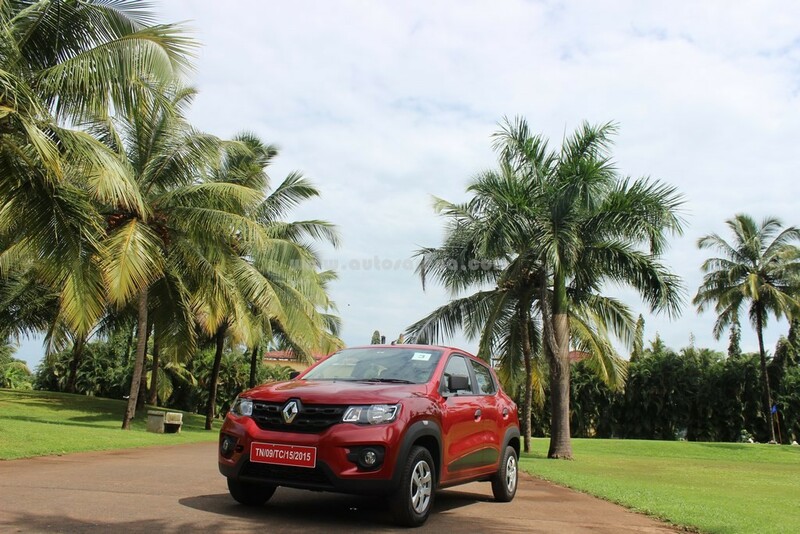 Renault has designed the Kwid to meet all standard crash safety norms as per Indian standards and can be equipped with more safety features if the customer is willing to pay as per company officials. 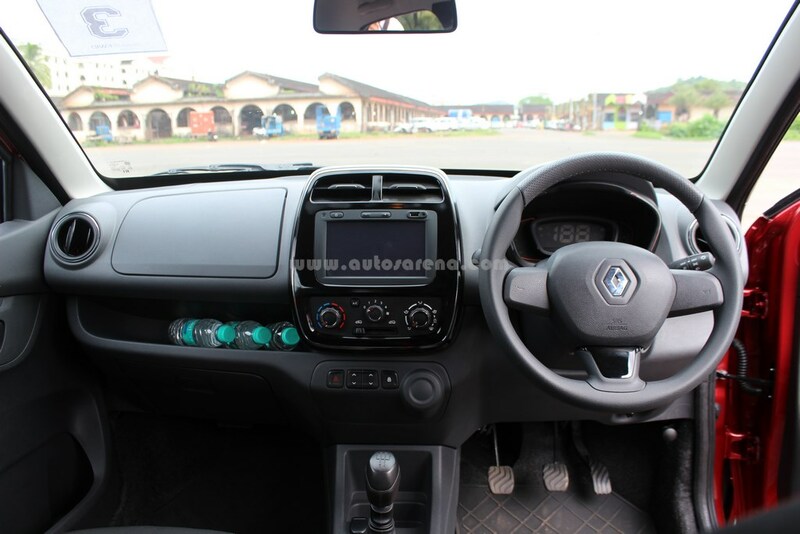 The Renault Kwid has been designed keeping in mind the Indian buyer and has all the ingredients to make a very good option for first time car buyers or those looking for a second car. 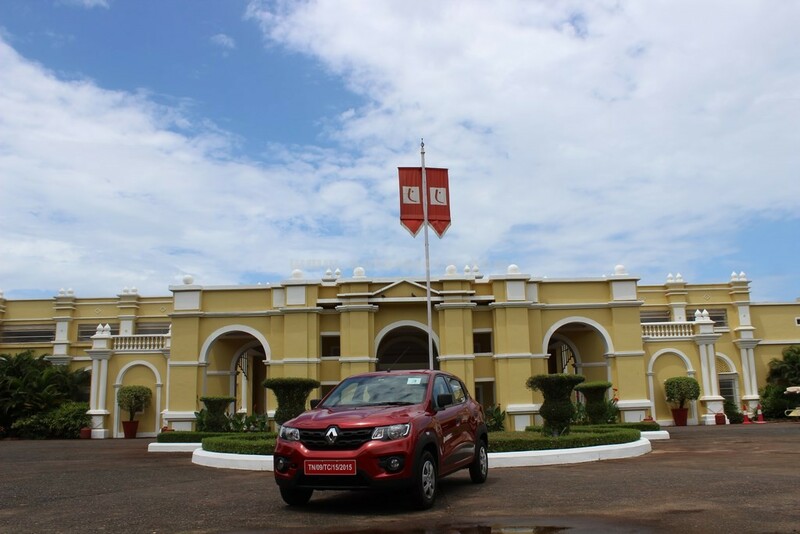 The Kwid is definitely a much better package in terms of design, performance, ride & handling and delivers high fuel efficiency. What could only cause stop the buyers is the dealer network which is still very low compared to two the big two players in India. Pricing has been indicative to be below the Rs. 4 lakh mark. We expect it to start at Rs. 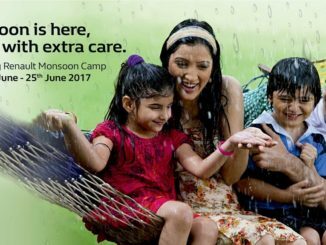 3 lakhs for the base going upto Rs. 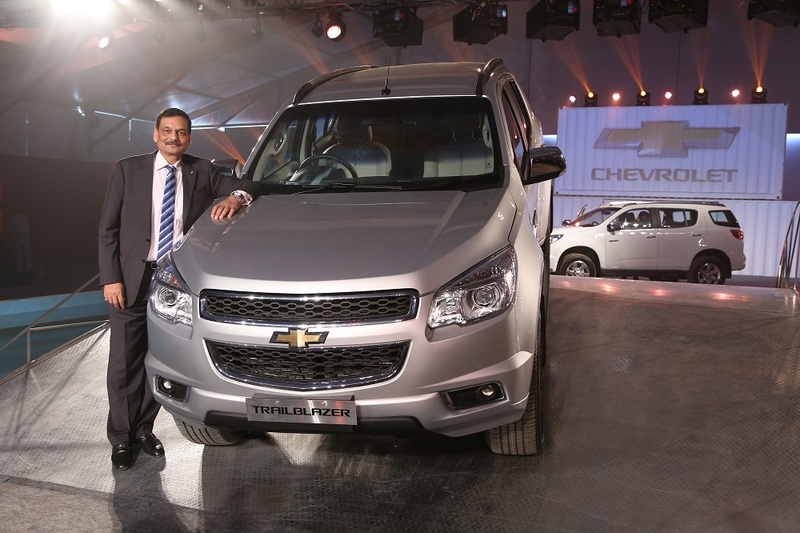 4.5 lakhs for the top end RxT with Air bag.